Essentially, JVT delivers a noticeable vibration while providing the distance in yards when the rangefinder locks on the flagstick and not on a nearby tree or a deer antler. So in this regard the Tour V3 matches the efficacy of its rival Laser Link for delivering quick and accurate yardage to the flagstick and not to other objects—especially with unsteady hands. However, the Bushnell is more portable and universally used than the Laser Link. What about its distance capability? I found the V3 Jolt to be accurate within one yard of competing devices so there’s no worries here unless one is a Jim Furyk-type and overly picky. 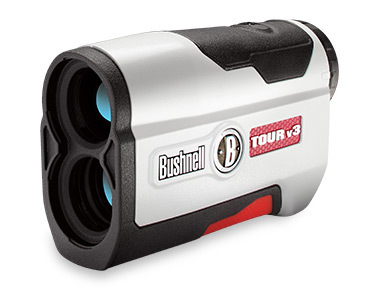 Note: Bushnell also offers a pricier X7 Tour model that’s accurate within three feet but that’s overkill in my estimation. Besides its comfy and compact size, the V3 also boasts a nifty carrying case. The case is ruggedly made, rainproof and sports a zipper and an elastic cord to allow easy access to the rangefinder during a round. There’s also a sturdy clip to attach the case securely to your bag. Bushnell also even included a cleaning cloth for the lens. Nice touch. After some usage this winter in Florida, I accidentally cleared my model of the Jolt feature. But one call to Bushnell’s customer service got me back on track after a few simple steps to reactivate it. There’s also a two-year warranty. Bushnell also sells a V3 Slope Edition. Due to it imparting a slope metric (how much uphill or downhill) in the shot and final distance equation, this edition is non-conforming for USGA purposes and tournament play. Of course, if you’re a tour caddie—or aspire to be one—it’s a good tool for surveying your player’s shots during a practice round. One final bit of advice for fellow senior players and absent-minded professors: place a mailing label on your rangefinder. If left on a bench at a par-3 or inside the cart after the round, an honest soul may retrieve it and kindly turn it in to the pro shop. That good fortune will deliver another pleasant jolt. TOPICS: Equipment, Golf	Tags: Bushnell Rangefinder, distance, Father's Day gift, golfer's gift ideas, Laser rangefinder, NCAA Men's Division II golf finals, Terry Moore, The Meadows, Tour v3 Jolt, USGA approved.